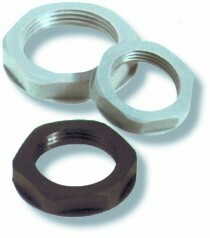 A range of nylon and nickel plated brass locknuts to fasten the Skintop® glands. These accessories are manufactured to the same high quality as the glands and ensure fast and easy installation of the appropriate products. The SKINDICHT® BLK-GL-M / BL-M are blanking plugs made of Polyamide or metal, for ensuring the ingress protection of un-used pre threaded holes. The SKINDICHT® range of reducers enable the use of cable glands with smaller connection threads than the already existing threaded hole in machines, devices and housings. The SKINDICHT® enlargers enable the use of cable glands with larger connection threads than the already existing threaded hole in machines, devices and housings. An adaptor that allows the use of PG parts in pre-tapped metric threads.